Home Page | Press Releases | New Flat Spin Record! Spencer Suderman who just attained the Guinness Book of World Records for 98 inverted flat spins powered with an EarthX battery! 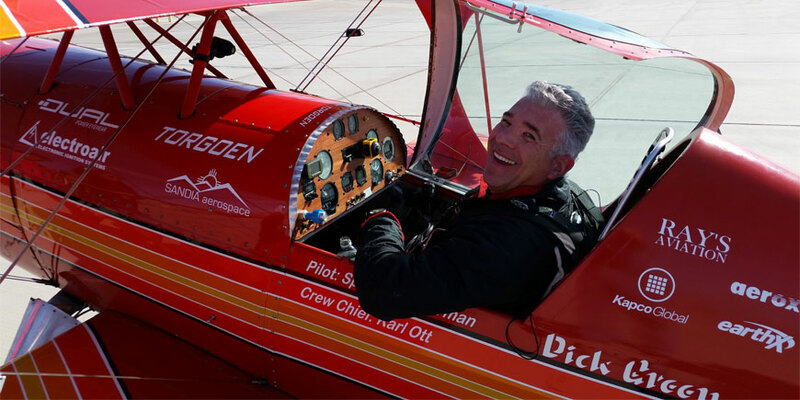 Spencer Suderman broke Wayne Handley’s inverted flat spin record (78 turns) on March 13, 2014 with an 81 turn spin at NAF El Centro from 23,000′ and recovered at 2,000′. On March 20, 2016, he broke his own record with a 98 turn spin! It took 3 tries to accomplish this and started at 24,500′ with a recovery at 2000′ AGL. The descent took just under 3 minutes. Departing from Yuma International Airport/MCAS Yuma he was given permission by the US Marine Corps to enter the restricted airspace over the Barry M Goldwater Range and cleared up to 50,000′. Aerobatic planes are designed for low altitude flying and are limited in performance in the higher altitudes. Since the Sunbird is experimental it became a test bed for several technologies to lighten the plane and make it perform better. Sandia Aerospace provided a lightweight STC’d STX-165 transponder/encoder unit, EarthX Inc provided a lightweight lithium iron battery that weighs 3.9 lbs and Micro Aerodynamics Inc provided vortex generators that enabled the flight controls to remain effective in the high altitude thin air for the climb and spin entry. Aerox provided a full mask re-breather bag type oxygen system which is STC’d for use up to FL250 and makes efficient use of the oxygen bottle thus allowing the smallest and lightest version to provide a sufficient supply.